The head of MI6, Sir Richard Dearlove, is to stand down next year, the Foreign Office has confirmed. A spokesman said Sir Richard, 58, would be retiring in August 2004 but denied the move was motivated by any differences with ministers over Iraq. The Observer newspaper claimed the departure was caused by unhappiness over Downing Street's handling of intelligence on Iraq. 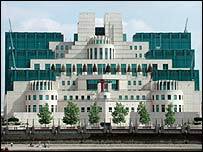 But the spokesman said Sir Richard's term of five years was the normal length for the head of MI6 - the post known as C.
He said: "Sir Richard Dearlove continues to enjoy the fullest possible confidence of the prime minister, the foreign secretary and the rest of the government on Iraq and all other intelligence issues. "He intends to leave his post as planned in August 2004 on completion of his normal tour of office. "This is in no way connected to events relating to Iraq." The spokesman said Sir Richard Dearlove was appointed in August 1999 for a term of five years. His predecessors David Spedding (1994 to 1999) and Colin McColl (1988 to 1994) served the same length, he added. Liberal Democrat foreign affairs spokesman Menzies Campbell said the "considerable tension" between Downing Street and the intelligence agencies "dates back long before the present controversy" over Iraq. "In order to re-establish a proper relationship it is almost certainly necessary for the head of MI6 to go," he said. "Sir Richard Dearlove, who has been a distinguished public servant, is taking the honourable way out." The Foreign Office would not comment on his successor, but it was recently reported that Sir Richard took the unusual step of appointing a deputy. The Observer suggested Downing Street would prefer the chairman of the Joint Intelligence Committee, John Scarlett. According to the paper, Mr Scarlett, a former MI6 officer who served as head of Moscow station, is close to both Tony Blair and his Downing Street communications chief Alastair Campbell. Sir Richard, a Cambridge graduate, joined MI6 aged 21. He is married with three grown-up children and was given an OBE in 1984.